A place to put my thoughts into writing. Today, I pulled up or hacked off a forest of baby maple trees, masses of nightshade vines, and a bramble thicket. The only thing that was supposed to be in the spot at the end of my driveway was a hydrangea. Our elderly neighbor tells us that the hydrangea out front was planted when the original family moved in. We bought our house from the daughter of the family that built it in 1917. I think that's so cool, to have a nearly 100-year-old flower bloom, welcoming everyone who passes by our driveway. Sadly, I had neglected weeding for the past several years. The poor plant was hardly even visible. Instead of masses of platter-sized white blossom clusters, this year we had just a few clusters the size of a hand. It's not exactly New Year's, but here is my resolution: stay on top of my yard a little better, so we can enjoy the show for many decades to come. Three years ago, I moved my panther lilies. They were one of the many flowers that had come with our house, and had probably been in the same location for decades. Every year, they would lean away from the house until they fell over. Looking for sunlight, I guessed. So I moved them to the edge of our yard: the neighbor's yard is much sunnier. The new flower location is more along a deer "trail". Now the panther lilies provide more mouthfuls for our local cervine population. The past couple of years, we've been lucky to have one flower escape the mouths of deer. I have wondered if my move was a good choice. Now, the panther lilies are blooming. And not - as was the case every year near the house - just one flower to one plant. They have two, three, even four flowers on just one plant. These are happy flowers. Sunlight beats deer. Yesterday in Bible study, we came upon the topic of charity. A lively discussion ensued. An example of a charitable cause was given; it was disputed that the cause was a charitable activity. One person claimed that people who give nothing to charity miss the boat on an important moral obligation; another countered that we don't know everything people do with their money or what their reasons are and should not judge. There were some hard feelings generated during the conversation on charity; the sensitive nature of this topic took me by surprise. It's a topic I find very interesting and hope comes up again, with a caveat: that our group members can contribute to the conversation without generating any of the defensiveness I saw yesterday. Diplomacy, please hang out with us all. Fifteen years ago I had my fourteenth birthday. For my birthday, my grandmother sent me a ceramic cow. It was posed sitting on its back legs; from hind end to top of its head the cow was about 8" tall. Included with the cow was another package. Unwrapping it, I found four wooden eggs. The eggs were painted black and white, and were sized to perfectly fit around the legs of the cow: cow eggs. I was delighted to no end. The cow and her eggs were prominently displayed in my room for many years. A month ago, I was shopping at Pier One. I found a large mug painted in the white-with-black-spots cow pattern. It had feet, of a sort: painted pink to look like udders. I thought of my grandmother, and the happy exchange we'd had with the cow eggs. I bought the mug, and intended to talk to her about it. The next week, my mother called. My grandmother had passed away. I will miss her. I'm sad we won't share any new memories, cow-related or otherwise. I'm happy I have the memories I do. Farewell. For the past week, I have seen movement of a small-dog-sized animal. A tail, a quick movement as it ran behind the garage. Racoons are common in my neighborhood, and woodchuck (groundhog) sightings are common in my yard. The flashes of fur seemed a little too orange to be woodchuck or racoon. But what else, I thought, could it be? Surely not a fox. Well, yes. It surely was. The fox is, right now, asleep about four feet from my living room window. Apparently that pile of leaves makes a nice fox-bed. It was an exciting sight: I woke my husband up and made him come downstairs. The fox woke up when a bird flew by, looked around, and went right back to sleep. And I'm not alone: the Illinois Department of Natural Resources has a bulletin from 2004 about foxes in cities. The bulletin says they eat mainly rabbits and mice (and can survive on insects and nuts if needed) and do not attack cats or dogs. Sounds like a useful animal. Welcome to my yard, fox. 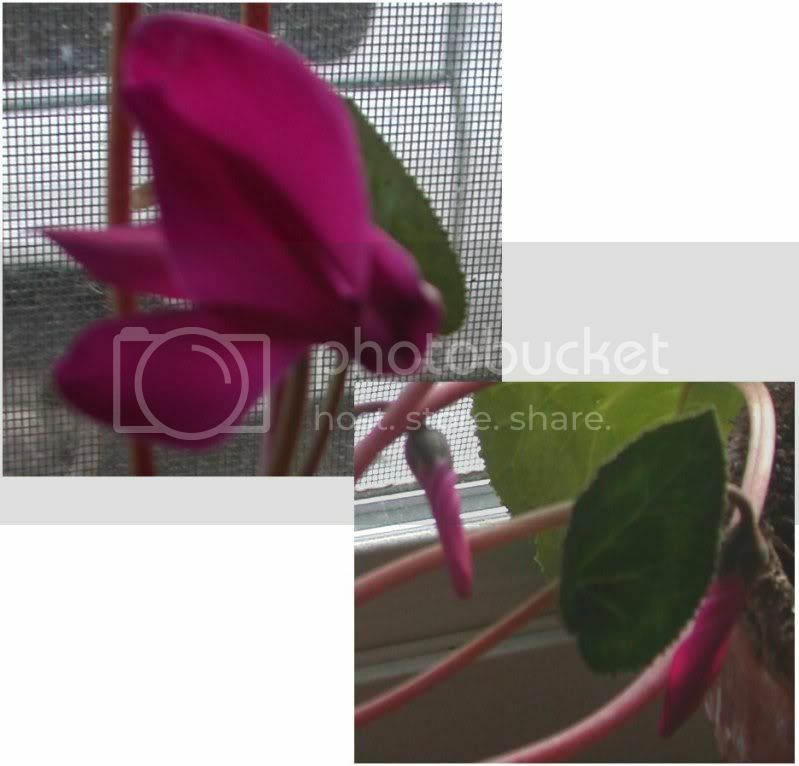 Yesterday, I divided my cyclamen plant. I've had it for six years; it was time. Yesterday was a warm day; most of the snow had melted overnight and in the morning. My compost pile was easy to work in, and I dug up a potful of soil. I sat on the porch (no coat! so warm!) with my supplies, and mixed the compost with perlite and coconut fiber. Time for the cyclamen to come out: I turned the pot upside down and started shaking. Shake, shake. Shake, shake. No movement. I stared at the roots coming out of the bottom of the pot, wondering if they were stuck inside. I was afraid to pull on the plant top: cyclamen stems are fragile. Shake, shake - it was loose! I eased the rootball out of the pot and started prying it apart. I think I was expecting bulblets that would peel off. What I actually found was a solid mass, about the size and shape of a small donut. What was this? Could it be divided? Off to the internet. Cyclamens have corms, which can be divided, but not by pulling apart with fingers. They require a sharp knife. So, paring knife fetched from the kitchen. I cut the tuber like a cheese wheel. Each wedge into a pot, add my prepared potting mix. All done - plants back to the kitchen window with a fresh watering, supplies put back away. And wait. Plants don't always take well to having their roots messed with. Taking a sharp knife to a living thing and cutting it into pieces seems an illogical way to promote its health. I come downstairs this morning, into the kitchen for breakfast: the windowsill has four perky-looking plants. They seem happy in their new homes. I'm happy I could do that for them. Now I have four cyclamen plants, only one of which I intend to keep. All with flower buds. Three to give away. So, who needs a new houseplant? Would you like to restart your computer now? YES! Yesterday, I broke my mother-in-law's computer. When turned on, it would show the Dell logo, then a cursor would blink a few times. Then blackness. An hour later, after much rebooting and Windows startup repair utility failing - twice - I managed a system restore to a point before I broke the computer. And then I spent another hour reassuring my mother-in-law, and fixing the things I had gone over there to fix: installing a new mouse (the LED in her mouse had burned out - who ever heard of that happening?) and removing expired antivirus software. The cause of the breakdown? When prompted "would you like to restart now?" after installing software for the new mouse, I said "no". And then I uninstalled the expired antivirus software, which also required a restart. Only, after doing those two things with no restart in between, the computer was no longer able to boot. I have never before broken a computer that severely. It was especially scary because I did it to someone else's machine. Yikes. Moral of the story: if your computer wants to restart, SAY YES!